Holy and Divine instrument of wisdom, bright and harmonious trumpet of theology, with one voice, we praise you, O Gregory, preacher of God. Since your mind now stands before the First Mind, guide our minds to Him, O Father, that we may cry to You, "Hail Herald of Grace." 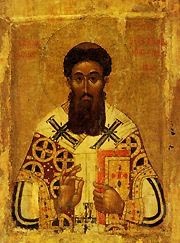 Share the feast of Sunday of St. Gregory Palamas with an icon greeting ecard.